In 2016, following a cluster of tragic fatalities and serious injuries on NE 65th St of people walking and biking, Seattle Neighborhood Greenways brought together a coalition to make safety improvements. NE Seattle Greenways held a community rally and safety walk with District 4 Councilmember Rob Johnson. 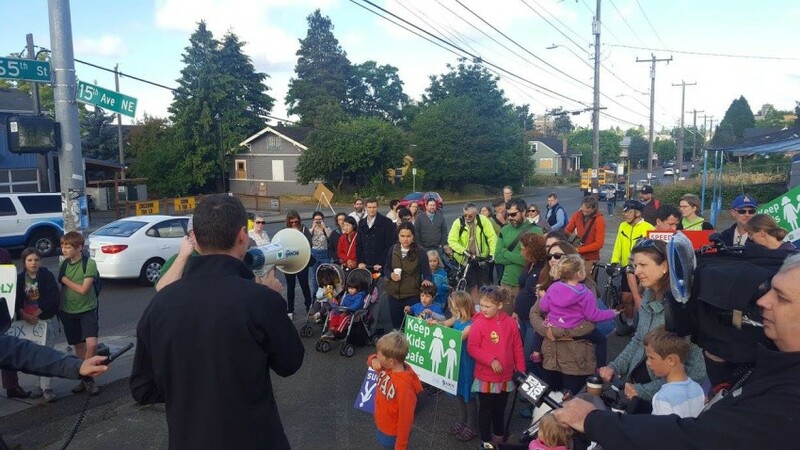 Hundreds of people signed our petition, and powerful local neighborhood groups (Roosevelt Neighborhood Association & Ravenna-Bryant Community Association) joined up to make safety on NE 65th one of their priorities as well. 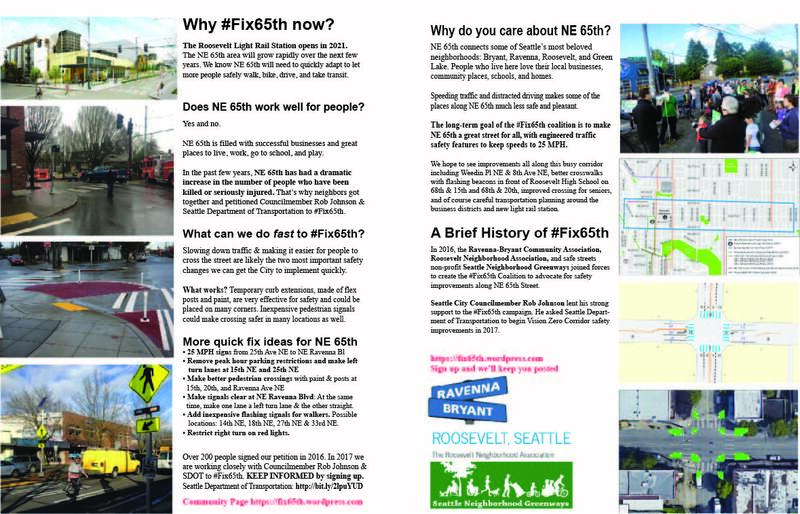 Our #Fix65th coalition and Councilmember Johnson’s support were just what was needed to make #fix65th a priority for Seattle Department of Transportation (SDOT), and late in 2016 the City funded and began to plan for a safer, more functional street. Making NE 65th a great street for people who walk, bike, take the bus, shop, go to school, and live is even more critical now than ever with the Roosevelt Light Rail Station due to open in 2021. 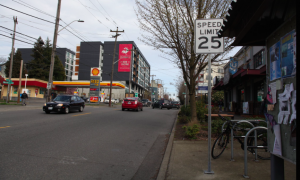 We’re super excited to report, based on our coalition’s recommendations, that SDOT has already changed speed signs to 25 MPH (they were 30 MPH), and improved existing traffic signals. Make sure to attend the next SDOT #Fix65th Open House on May 18 to see what else is in the works for 2017. If you can’t attend the May 18 meeting, SDOT has an on-line survey up in May to record your ideas as well. 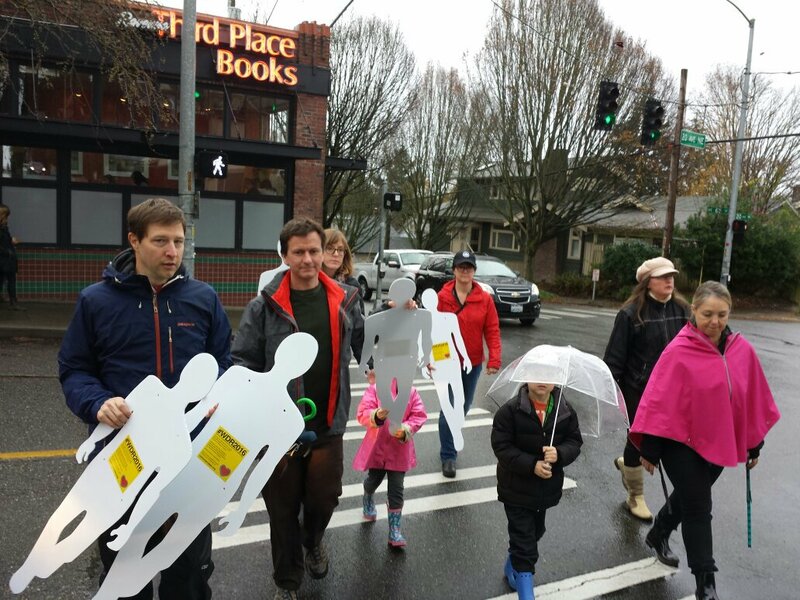 Who: Everyone who lives, works, plays, or travels along NE 65th St.
Why: Because we all need safe, healthy streets! 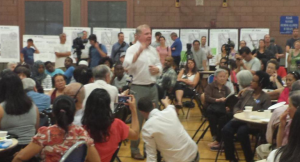 In a sweltering and packed gymnasium, with the Mayor, City Councilmember Bruce Harrell, and Seattle Department of Transportation (SDOT) Director Scott Kubly shouting through a rolled up paper megaphone (the sound system had failed), three of the most transformative projects SDOT has proposed to date were launched. Rainier North-South Greenway stretching from I-90 to Rainier Beach. Will be completed in 2016. 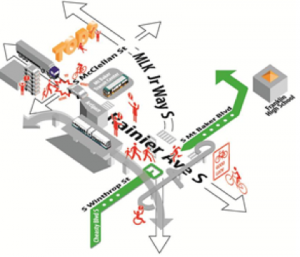 Route identified with extensive input from Rainier Valley Greenways and Seattle Bike Advisory Board. Accessible Mt. 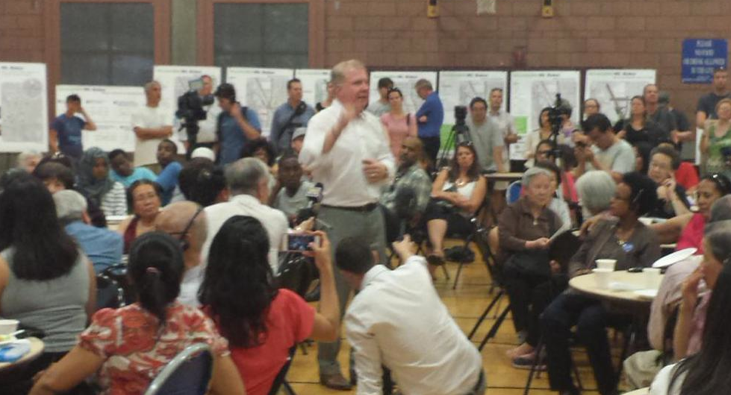 Baker signals an SDOT commitment to prioritize people around transit. It’s too long been the norm for Sound Transit to plop in light rail stations and blithely leave it up to local municipalities to make their stations accessible to people who need to walk or bike to them. Accessible Mt. Baker takes up the challenge with a real station area planning. Rainier Avenue South Safety Corridor Pilot begins construction on Monday August 3 and wraps up construction on August 14. Not only is did SDOT’s Vision Zero Strategic Advisor Jim Curtin present an unprecedentedly short project timeline, the Rainier Ave S project has the potential to transform what is Seattle’s most deadly street.